Add light and space while creating your own tropical oasis in the kitchen or family room with our Garden Replacement Windows. VARCO garden windows are constructed of fusion-welded vinyl frames and sashes and feature screened casement window vents that allow an abundance of light to shine through and nourish plants and flowers. The garden window's standard birch veneer surround can be sealed, stained or painted to match your interior decor. 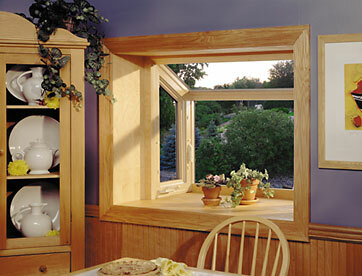 An optional oak veneer surround is also available for our 300 Series Garden Window. Available in a wide variety of painted exterior colors as well as interior woodgrain and paint/stainable laminate options.